Do Cats Whiskers Get Longer as They Get Older? Your cat's whiskers will grow for his entire life. If you find your cat's whiskers to be one of his most charming features, then never fear. If your little one's whiskers are for whatever reason accidentally clipped, they will grow back just as strong as before -- phew. Whiskers aren't just hairs -- they also offer useful sensory properties. To an unassuming outsider, a cat's whiskers may just look like thick and sturdy hairs spouting from his face. However, there is more to it than that. According to the Merck Manual for Pet Health, the long hairs also provide sensory functions to a feline. 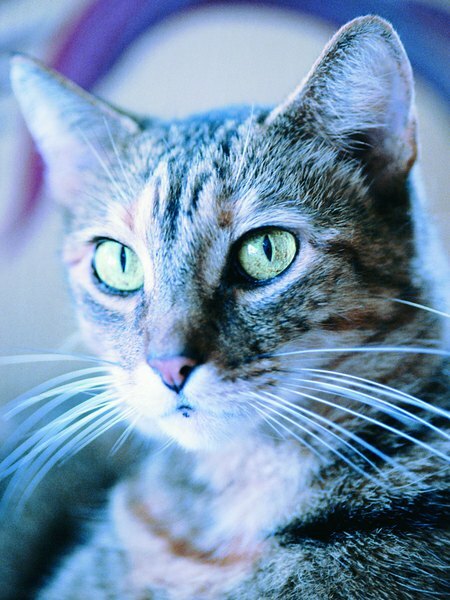 Whiskers are directly connected to facial nerve cells. Essentially, whiskers are a lot more useful than human facial hair, from being able to assist a cat in seeing more clearly at night to detecting the availability of nearby prey. 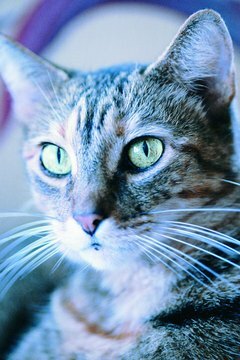 Because of these types of benefits, whiskers are extremely helpful to a cat, no matter his age. For any cat owner, it is crucial to know know never to cut off a cat's whiskers. If a fluffball's whiskers are trimmed for any reason, even if by pure accident, it could lead to a world of uncertainty. When a cat seems just be out of it and in a daze, problems with the whiskers are a likely culprit. Because whiskers are indirectly linked to a cat's brain via the nerve cells, the lack of them could trigger everything from general coordination and balance dilemmas to problems getting around in the dark. According to the Cornell University College of Veterinary Medicine, whiskers are capable of detecting even the most subtle of motions -- highly useful for cats. Thankfully, cat whiskers are similar to other types of hair in that they do eventually grow back, at least if there isn't major destruction to the follicles. It usually takes a couple of weeks for a kitty's whiskers to grow back in full force, so be patient! Cat whiskers do not grow at a faster pace when a cat ages. The rigid hairs usually stay the same length for a cat's entire life, unless of course someone accidentally cuts them. The biggest differences you may notice in a cat's whiskers as he ages are a little bit of possible graying and possibly a stray strand falling out every now and then -- no biggie, of course. When a cat whisker falls to the ground, a new one is always going to be ready soon to take its spot. How Big Do Pearlscale Goldfish Get? How Do Pugs Get Worms? Do Parrots Mimic Sounds to Get Attention? How Long Does It Take for Dog Whiskers to Grow? Do Raccoons & Cats Get Along? Can You Tell How Old a Cat Is by Their Whiskers? Do Cats Get Picky When They Get Older?